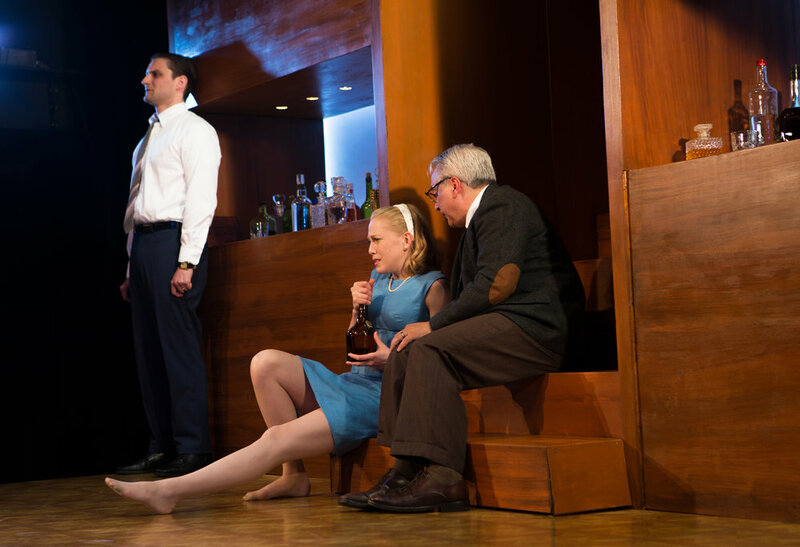 "With a set consisting of only a staircase and a luminous rack of liquor, Jackson sets Albee’s iconic characters free. Unchained from realist decor, George, Martha, Nick, and Honey take on the fury of warring Greek gods. And somehow, through a kind of magic, the characters seem all the more human for it. The show is a pure and unrelenting act of imagination on the part of everyone involved." "Jackson hasn’t come up with a concept so much as an assault; not an interpretation but a demand: that the play, the actors, the direction, the design, and the audience come together and perform a collective act of creation. And that’s what Albee probably wants — for us to see what the imagination really is and how the world around us is a product of its violent desires for happiness and peace... As the play unfurls its way to Albee’s haunting end, the production becomes so simple and alive that it hardly feels as if the brilliant cast is acting at all. They have become everything that we have imagined, and so they just say the lines and we happily and painfully fill in the rest. It’s like a carpet-bombing inside your head. Albee is dead, but Shotgun’s production brings his imagination bracingly back to life." "Amid the familiarity of this well-loved/feared play, the ever-intelligent and adventurous Jackson shakes things up... Thrilling... At more than three hours, this is a lot of play. But Jackson’s inventiveness and his sturdy quartet of actors ensure an evening that never lags." "Tight direction by Mark Jackson... This performance succeeds beyond expectations. I sat on the edge of my seat, totally engrossed during the entire three-act, three-hour performance... Kudos to director Mark Jackson and actors Beth Wilmurt and David Sinaiko for capturing the essence of this complex, still vital drama. This is a great play extremely well done. I highly recommend it." "Edward Albee’s Who’s Afraid of Virginia Woolf? strips bare the deceptions and bonds that hold together two horrible marriages. Shotgun Players’ current staging of the 1962 classic strips bare the dynamics of those relationships, without distractions. It’s a sizzling approach to a scathing drama, and thoroughly gripping for virtually every minute of its three-hour length... In the Berkeley theater’s very capable hands, Albee’s language and explorations of mystifying bonds that can keep people together are as powerful today as ever." "Superb direction, an intensely talented cast, and an unusual but creative production... Time and again, Mark Jackson as Director squeezes out every possible drop from Albee’s juicy script..."
"Jackson makes terrific use of the bareness of the stage, with standing characters towering over those sitting on the floor, highlighting the shifting power dynamics in the room. The blocking alone throughout the production is terribly dramatic." "Director Mark Jackson’s Woolf is deliciously big and bad indeed... Without so much as a bench or stool, the actors are forced to sit on the floor, lean against the sides of the stage or crowd the stairs. The sheer amount of crouching and drinking that goes on does much to heighten the play’s intense emotional discomfort..."
"Wilmurt glides across the stage, tapping parts of the set as if Martha is feeling the outlines of her soul. The scene is often played as a drunk lashing out at the world, at odds with everything and everyone around her. But Wilmurt’s touch is gentle and precise. Through her superb performance, we realize how fragile Martha is, and how delicate the life and world she’s made truly are. Drunk has never been so exacting and painful." "The physicality of play shows pure Mark Jackson. Took me back to The Death of Meyerhold. Those moments when everything that need be said was said in a high knee step, the twist of a foot, a dart-thrown tulip..."
"I was blown away by this production... Mark Jackson has staged a very impressive revival of Albee's most brilliant and hellish play." "Frightening... 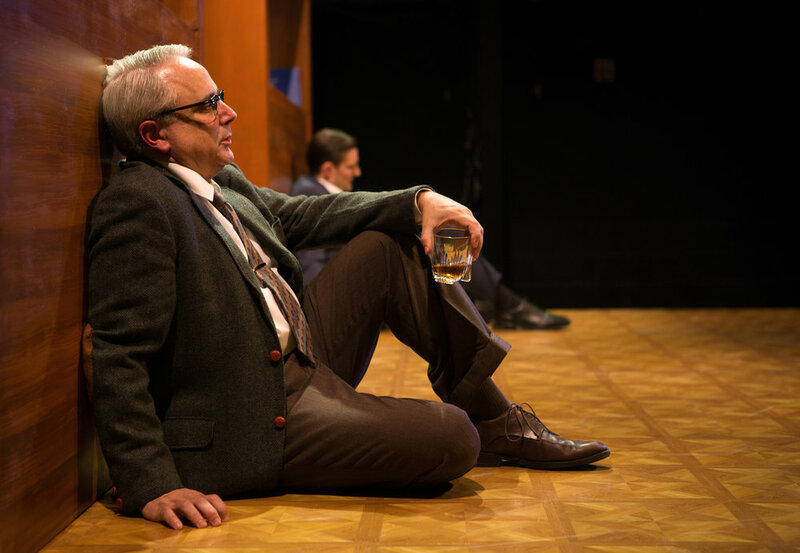 Shotgun Players shows that Albee’s ideas are very much alive — potently, unnervingly so." It was at once an honor, a joy and a trauma to work on Who’s Afraid of Virginia Woolf? Albee crafted one of the great American theatre scores, a soaring, searing jazz-opera written “in the key of marriage,” as critic Peter Lewis once put it. Virginia Woolf is a perfectly unsolvable mystery, not unlike a human being or longstanding relationship. With uncommon panache, unapologetic honesty, and deeply felt wit, Albee expertly conducts his quartet of voices in their arias, duets, trios and quartets about not only marriage, but the American dream, the blurry line between truth and illusion, and the direct connections between each of us and our collective national character. Our hope with this production was to put the breadth of possibilities inherent in what Albee wrote front and center, to clear away the familiar nicknacks and casting tropes and make the play itself clear, visible, and audible. Now that may seem pretty basic. But it was really hard! To begin with, Albee took pains to make it hard! I’m grateful to him for assuming the intelligence of his audience, not to mention our appetite for the truth, and for trusting us all—no matter how often various of us might argue with him on this or that—to engage with what he offers. But also, there are those of us who come to Who's Afraid of Virginia Woolf? with our expectations firmly in place, something often the case with great and well-known classics. Expectations are famous for killing possibilities. And so this is the opportunity with classics: to question expectation, to see and hear anew. Luckily, many more than not who attended the Shotgun production seemed excited by the possibilities in Albee's play, and the production enjoyed a very engaged response throughout its run. ...And it sold more drinks at intermission than any other show in the season. Just sayin'.